With a few simple ingredients and some easy instructions, you can warm the hearts of your family and friends with this gloriously easy to make realistic looking Grinch Guacamole. “Every Who down in Whoville liked Christmas a lot, but the Grinch who lived just North of Whoville, did not!” “The Grinch hated Christmas! The whole Christmas season!” “Now, please don’t ask why. No one quite knows the reason.” – Dr. Suess. So I had this idea. A wonderfully awful idea! And I chuckled and clucked, what a great Grinchy trick, with guacamole and some cream cheese, he’ll look just like St. Nick! Realistic Looking Grinch Guacamole – Kudos Kitchen Style. **Please Note – The printable recipe card with detailed instructions and complete ingredient measurements for making Realistic Looking Grinch Guacamole is available near the end of this post. 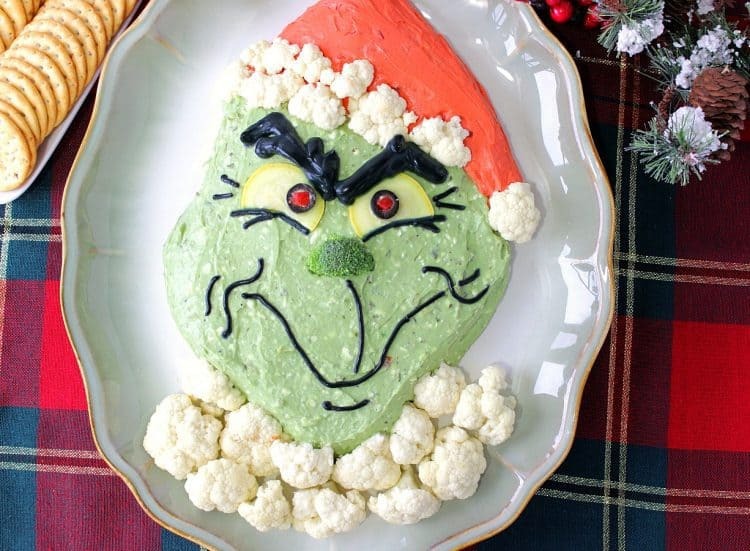 Grinch Guacamole comes together easily with cauliflower fur, a broccoli nose, and some tinted mayonnaise that is used to pipe on his evil grin and his big, bushy eyebrows. In only a few minutes, you’ll be amazed at how this gloriously Grinchy fellow comes to life right before your very eyes! Then the Whos, young and old, will sit down to a feast. And they’ll feast! And they’ll feast! And they’ll FEAST! FEAST! FEAST! Assemble your ingredients: 2 blocks (8 ounces) cream cheese (softened), 2 packages (8 ounces) prepared guacamole, 2 tablespoons diced pimentos, 2 teaspoons smoked paprika, 1 teaspoon garlic powder, ½ teaspoon black pepper, ½ teaspoon salt,1 tablespoon cilantro or basil paste, cauliflower florets, red, green and black gel food color, 3/4 cup mayonnaise, 2 slices black olives, 2 yellow zucchini slices. *Note – not all the ingredients are shown in the photo below. 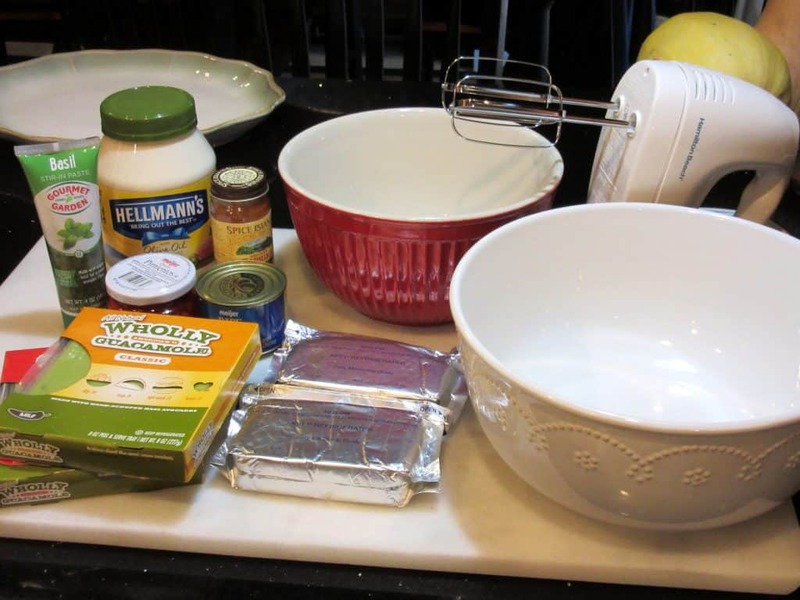 And assemble your kitchen equipment: A large serving platter, 1 large bowl, 1 medium bowl, 1 small bowl, hand mixer, spatula, large zip-top bag or piping bag, and scissors. In a large bowl blend together 10 ounces of softened cream cheese, 2 packages (8 ounces each) prepared guacamole, salt, pepper, garlic powder, and basil or cilantro paste. Blend until creamy. Add a few drops of green food gel (if desired) and blend until you achieve your preferred Grinchy shade of green. Spoon the Grinch guacamole into the center of a large serving platter and use a spatula to shape the guacamole into a modified diamond shape, making sure to give your Grinch to large cheeks and a pointy chin. Use a damp paper towel to clean up any smears on the platter as you go and to give your Grinch a clean edge. Use the spatula to gently push the guacamole into angle into the top of the Grinch’s head in order for his Santa hat to sit at a jaunty angle. Set the platter aside while you mix up the Santa hat ingredients. In a medium bowl, blend the remaining 6 ounces of softened cream cheese, 2 tablespoons drained pimentos (reserving two for his pupils), 2 teaspoons smoked paprika. Once blended, add a few drops of red gel food color until you reach your desired shade of red, and mix in 1 tablespoon sriracha (if desired). 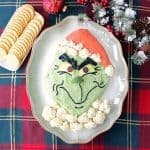 Spoon the Santa hat cream cheese onto the side of the Grinch’s head where you angled his face to accommodate his hat. Use a spatula to smooth and shape the Santa hat, and clean the smears on the platter with a damp paper towel. 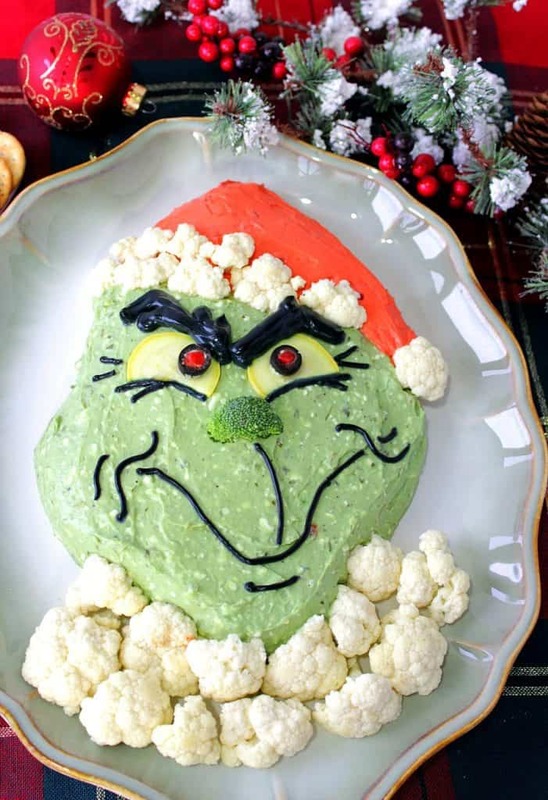 Place the cauliflower florets as the rim of the Grinch’s Santa hat, the ball, and around his neckline as the collar of his suit. Slice two ¼” slices from a yellow zucchini (approximately 2″ in circumference) and then use a paring knife to cut two rounded pieces from the bottom of each zucchini slice. 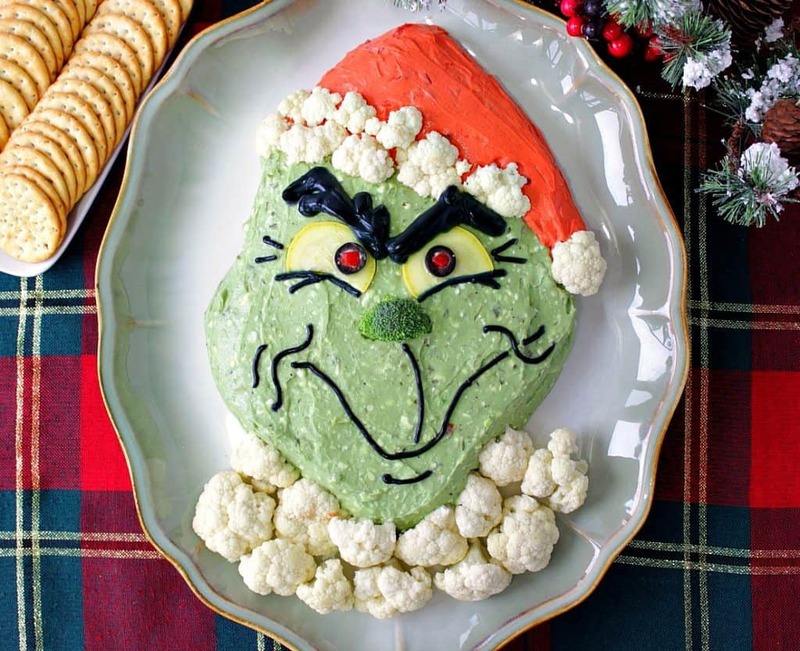 Place the zucchini slices (eyes) on the Grinch’s face, and on a slight angle. Use place a pimento piece inside each olive slice and place on the zucchini to resemble the eyeballs and pupils. In a small bowl, mix together the mayonnaise and a few drops of black gel food color until you achieve your desired hue. Spoon the mayonnaise mixture into a large zip lock bag (or a piping bag), and use scissors to snip a small corner so you can pipe a thin line for the Grinch’s eye lines, mouth, and cheeks. Snip a larger tip from the bag and pipe on the Grinch’s heavy, evil eyebrows. Press a small broccoli floret just under his eyes for his nose. The following Amazon.com items are some suggested products I’ve chosen that will aid you in the making (and serving) of this Grinchy Guacamole Appetizer if needed. By clicking on the item, you’ll be taken directly to Amazon.com if you’re interested in purchasing any of these products. You are in no way required to do so, and you will not be charged in any way unless you decide to purchase a product through Amazon. You’re a foul one, Mr. Grinch. You’re a nasty-wasty skunk. Your heart is full of unwashed socks. Your soul is full of gunk. Mr. Grinch! The three words that best describe you are as follows, and I quote, “Stink, stank, stunk”! With a few simple ingredients and some easy instructions, you can warm the hearts of your family and friends with this Gloriously Grinchy Guacamole Appetizer. In a large bowl, blend together 10 ounces of softened cream cheese along with the guacamole, salt, pepper, and garlic powder. Add the cilantro (or basil paste) along with a few drops of green gel color until you achieve your desired shade of green. Spread the green guacamole dip in the center of a large serving platter in a modified diamond shape, making sure to give him large cheeks and a pointy chin. Use a damp paper towel to clean any smears on the platter and to give the Grinch a nice, clean edge. Use a spatula to angle off the top of his forehead so the Santa hat will sit on a jaunty angle. Smooth the guacamole with the spatula. Set aside. In a medium bowl, blend the remaining cream cheese, pimentos, smoked paprika until smooth. Stir in enough red food gel until you achieve your desired hue, and then mix in the sriracha (if desired). Spoon the red cream cheese mixture on the side where you angled the Grinch head and use a spatula to smooth and form the mixture into a Santa hat. Gently press cauliflower florets to form the fur trim of the hat, and place them around the base of his face to form the fir trim of his suit. Use a paring knife to cut semi-rounded pieces from each of the yellow zucchini slices. Press a pimento piece in the center of each black olive slice. Gently press the cut zucchini slices into the Grinch face, on a slight angle. Place the pimento and olive slices on the zucchini slices to form the eyeballs and pupils. In a small bowl mix together the mayonnaise and a few drops of black gel food color until you achieve your desired hue. Spoon the mayonnaise mixture into a large zip top bag, or a piping bag. Snip a small hole in the corner of the bag and gently (and consistently) squeeze the bag to pipe out the Grinch's eye lines, mouth, and cheeks. Snip a larger hole in the corner of the bag and pipe some thick, bushy eyebrows (on angles) over the very tops of the zucchini eyes. Finish by placing a small broccoli floret right below his eyes, for his nose. Serve with crackers, chips, vegetables, and roast beast. large serving platter, spatula, hand blender, wooden spoon, large zip-top bag (or pastry bag), scissors, paring knife, red, green, black gel food color, small, medium, large bowls. Maybe Christmas, he thought, doesn’t come from a store. Maybe Christmas, perhaps, means a little bit more! And what happened then? Well, in Whoville they say… that the Grinch’s small heart grew three sizes that day! I sincerely hope you’ve enjoyed today’s recipe and instructions for making Grinch Guacamole. I love, love, love this!! Thank you so much for sharing this fun idea, I can’t wait to make it! You are soooo talented! This is such a great idea! 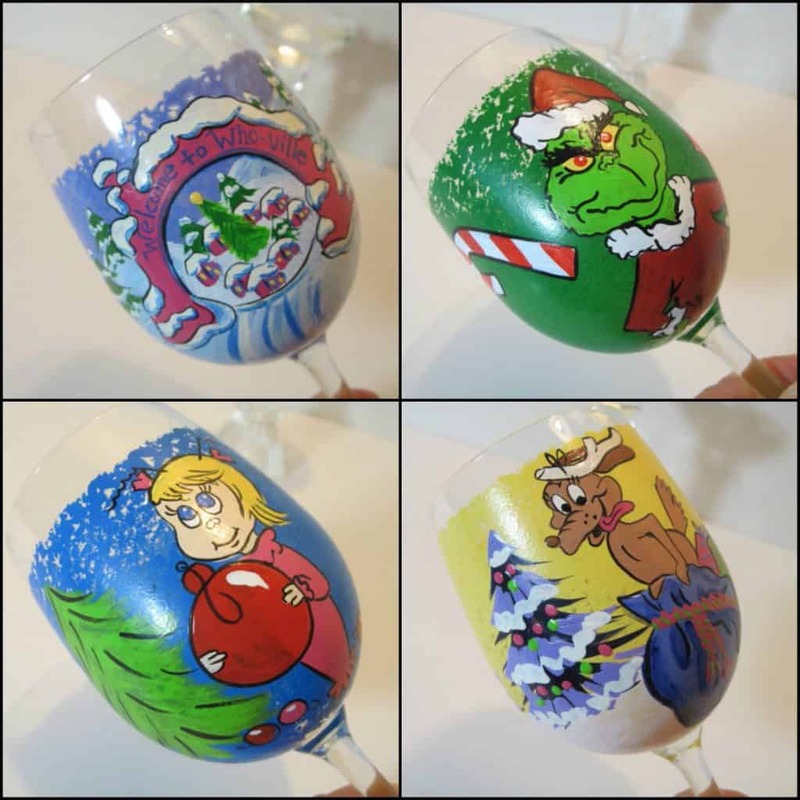 Fun for holiday parties! This is seriously so fun and inventive! Genius! This is the cutest idea and a guarantee to be the hit at any party that you take it too! You nailed the Grinch! Love it! 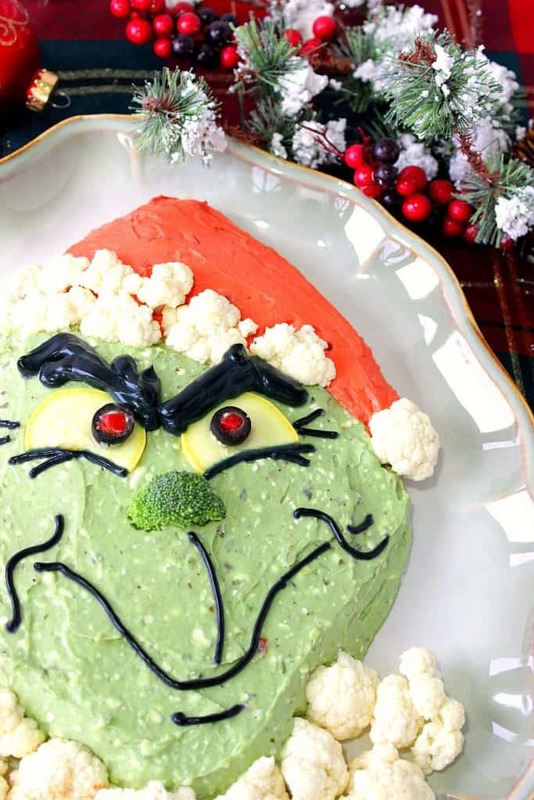 This Grinch-y guac is SO CUTE! This’ll be a hit this Christmastime FOR SURE. Oh my goodness, that is way too clever! LOVE the cauliflower, so cute! LOVE this idea! Every year since I was a little girl, my dad read The Grinch to us on Christmas Eve, and now I carry on the same tradition with my boys. It is adored by my whole family. I think that means I will have to order some of those amazing glasses! Glad you like the guacamole, and glassware. Thanks so much, Dara! This is seriously the CUTEST Christmas dip ever!!! Awesome! This is so creative! Beautiful! I can’t wait to try this for our Christmas party at school! A good way to get kids to eat their veggies! That’s awesome, Michelle. 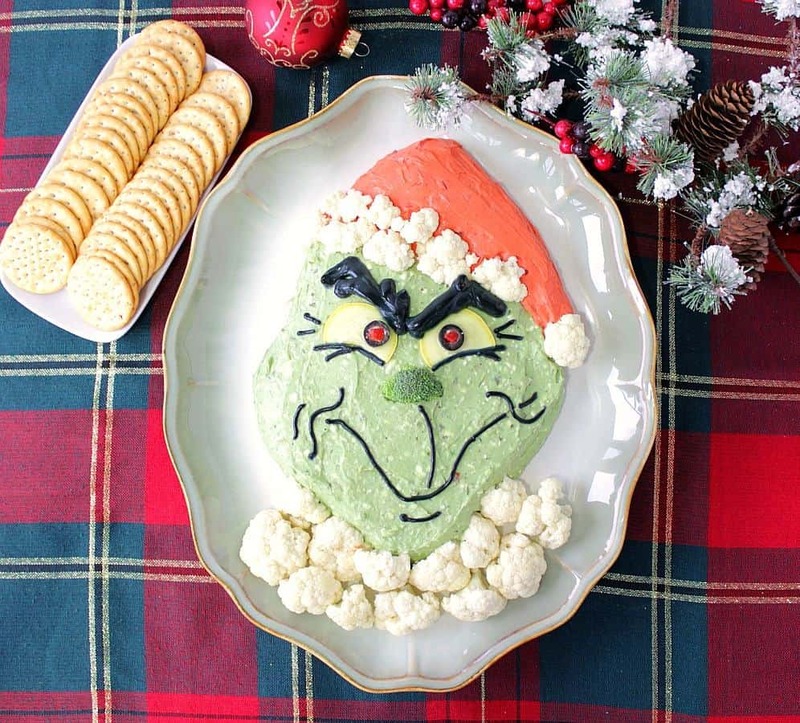 The kids are going to love digging into the Grinch with their carrot sticks and veggies! I love the idea of bringing him to school. Please let me know what the kids thought if you have time. I’d love to hear. I love anything Grinch, and Guacamole! What a great idea! Creative! Have just make a trial but uhm, maybe I have no talent in decor, my dip is so odd. I will practise again and again, and hope next times, they will look cute as yours. Thanks for sharing the genius idea, Renée ! Yours is probably not as bad as you say. However, if you ever want to send me a photo of your work I will try and help you out with a few pointers.